In response to growing market demand, Stena Line is planning to upweight its freight capacity on the popular Belfast – Liverpool route. This month Stena will initially deploy the 3,000 lane metre Stena Forerunner vessel before replacing it with a similar ship early in 2019, at which point the Stena Forerunner will return to service in the North Sea. Commenting on the development, Stena Line’s CEO Niclas Mårtensson said: “Demand for freight capacity from Belfast continues to increase and we believe it is vital that Stena Line provides the necessary capacity and frequency to enable that expansion to flourish. Stena Line will continue to operate seven vessels on its three routes to and from Belfast serving Cairnryan, Heysham and Liverpool, and the introduction of the Stena Forerunner will provide us with greater capacity and flexibility to service market demand. 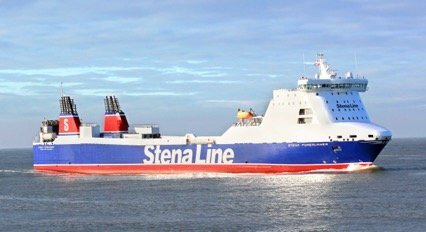 When Stena Line initially deploys the 3,000 lane metre Stena Forerunner on the Belfast-Liverpool route it will increase weekly freight capacity on the service by almost 10%. Stena Line will replace it with a similar ship early in 2019 at which point the Stena Forerunner will return to service in the North Sea. “Stena Line is actively seeking relief tonnage for the North Sea during this period as we are fully aware that a reduction in the number of ships, though temporary, is not the optimal solution for our customers there,” explained Björn Petrusson, Stena Line’s Chief Commercial Officer, North Sea & Irish Sea.